special sauce and 1 1/2 cups of water. Let simmer until meat is good and tender. My special sauce will make the steak melt in your mouth. Fry corn tortillas in pan and add all the remaining ingredients above. 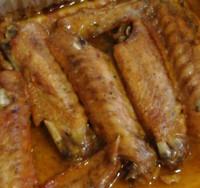 Season the Turkey Wings with your season and just a little amount of water in the bottom of your casserole dish and arrange Turkey Wings and top with half the butter and lemon juice, cover and bake for 2 hours uncover and baste with remainder of lemon and butter Bake uncovered for an additional 15 minutes at 350 degrees. 2 chopped large yellow onions. Cook neckbones in a large dutch oven or a really large pot. Add onions season salt and pepper, skim fat and slim off the meat. Cook until it is so tender that the meat falls off the bone. You can leave the bones or remove them. Add the veggies and the bay leaves and stew for 45 minutes on low heat. At this time make some jiffy corn bread. I always serve lemonade and then my folks throw down at the table! Don't forget to bless the food! In a deep-fryer, preheat oil to 350 degrees F.
Season tomatoes, on both sides, with salt and pepper. Place flour and garlic powder in a shallow dish. In another shallow dish, beat eggs with the milk. In another dish, mix bread crumbs with cayenne and paprika. Dredge tomatoes through the flour, then the eggs, and then through the bread crumbs. Add only a few pieces to the fryer at a time, so they can cook evenly, about 2 to 3 minutes. Drain on paper towels . Blend 1 can of evaporated milk with 1 large egg in a bowl and let set. Mix macaroni with pepper, sugar, and cayenne. Melt 1/3 stick of butter and put in bottom of casserole dish. Layer macaroni, sharp cheddar, mild, cheddar, Velveeta® and then pour milk and egg mixture over casserole. Bake in oven at 350 degrees F. until bubbling brown tips. VERY IMPORTANT! Let stand for 40 minutes before serving. 2 cups 3 cheese blend (any) corn bread. (Hot water corn bread, everybody's grandmother had a different recipe.) , Or 4 packs or Gold Medal® corn muffin mix (prepare according to package directions. Doubling the recipe.) Two packs of corn bread will be used for top and two for the bottom. Cook bottom bread completely. Bake in preheated 375 degree oven for 40 minutes or until golden. Cover and let simmer 20 minutes. In the meantime, wash and clean 5 bunches of collard greens, after cleaning cut bunches and place into stock pot. 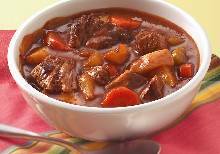 Cover and let slow simmer for 30-40 minutes or until desired tenderness. 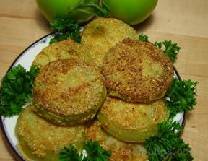 "Serve w/spicy corn bread. I think the soul food flair can be seen in the tastes and aromas." *I use my Fry Daddy/w basket..but a large cooking pot will do. Once oil is hot, drop seasoned chicken in. Juice lemons and place in separate bowl (refrigerate) (no seeds or pulp). Crumb graham crackers to make crust (2 of the 3 packs should be fine). In stainless steel or glass bowl (don't use plastic) beat all egg yolks. Gradually pour in both cans of milk. Mix well. Stir in lemon juice (refrigerate). 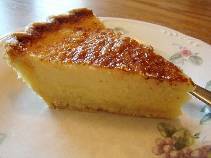 Melt butter and gradually mix graham cracker crumbs with butter to make crust (shouldn't be gummy). Should be able to sprinkle over lemon mixture. Layer bottom of casserole dish with crumbs. Pour lemon batter on top. Repeat layering and end with crumbs. Thoroughly rinse and clean chicken (remove as much fat as possible). I let mine soak in vinegar and water for about 1/2 hour. Mix flour and seasonings together in brown paper bag. Mix egg and milk together in a bowl. Dip chicken, one piece at a time into egg mixture then into flour bag. Coat evenly and allow to sit for about 15 minutes. Use enough vegetable oil so that chicken will be covered. Place chicken into pan when oil is hot. Fry till golden brown, covering the last 10 minutes. Drain. Put on stove in large pot of water on medium heat add salt. Put pig tails in pot of water and allow to cook until almost tender. Cook beans until they begin to boil add onion, garlic, bell pepper and crushed red peppers. When beans become slightly tender add ham seasoning, cook for 20 more minutes. Add pig tails and cook for 15 more minutes. Add lard or bacon fat. Cook until beans are tender (optional-add fresh chopped parsley). Serve over your favorite rice or with corn bread. In a large bowl, whisk together eggs and sugar. Whisk in remaining ingredients until smooth. Bake at 400 for 10 minutes. Reduce heat to 350 degrees and continue bake for 40 to 45 minutes. Combine all ingredients into a large bowl. 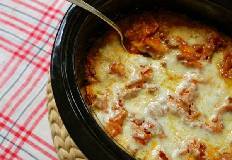 Dip chicken parts in the sauce and place in casserole dish. Bake at 350 degrees for 1 1/2 hours. basting occasionally. Use remaining sauce to pour over chick during the last 1/2 hour of cooking. For a decorative touch you can add about 1/2 cup of chopped pecans to remaining sauce before pouring over chicken. Preheat oven to 350°. Poke holes all over sweet potatoes and wrap each in foil. Place on a foil-lined rimmed baking sheet and roast until potatoes are tender, 60–70 minutes (if you have one, use a cake tester to poke right through foil). Unwrap and let sit until cool enough to handle. Increase oven temperature to 450°. Meanwhile, combine chile, honey, and butter in a small saucepan; season with salt. Bring to a simmer over low heat, stirring to combine. 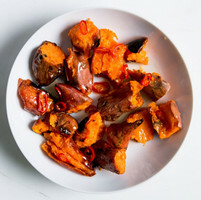 Smash sweet potatoes with your palm, then tear into bite-sized pieces (including skin), the more irregular, the better. Place in a large bowl and add half of hot honey (do not include chile as it will burn); season with salt. Arrange pieces, skin side down, in a single layer on an unlined rimmed baking sheet and roast until browned and crisp around the edges, 20–25 minutes. Drizzle with remaining hot honey with chile. Boil and cut skins off of the sweet potatoes,then cut up into mixing bowl. Add eggs,sugar and vanilla into the bowl and mix. Gradually add the milks into the mix along with the spices until all ingredients are mixed thoroughly. In a baking pan add flour , butter, dash of cinnamon and pecans, mix together. Flatten mixture across pan until the bottom of the pan is covered. Bake of 350 in preheated stove for 20 mins. After crust is finish add sweet potato mixture on top of the crust and bake for 45mins. When finished baking add marshmallow whipped topping immediately after taking casserole out of the stove. (Easier to spread!) Then sprinkle pecans on the top and serve. In a deep dish pan, put the oil and keep under an extremely low heat until. you are ready for it. Wash the chicken and cut into desired portions, sprinkle the all the seasoning on both sides of the chicken. Take the Blended Seasoning and apply liberally to both side of the chicken. Dip the chicken into the eggs and then into the bread crumbs, coating well. The oil should be hot enough by this time, turn the stove to medium heat and fry the chicken until golden brown on both sides and cooked through the middle. Put about 1/2 inch of water in a large pot, place the salt pork and red pepper flakes in the pot and simmer slowly about 15 minutes. When the water begins to evaporate pour about 1/4 cup bacon drippings in pot. Slice the onions and bell peppers in thin strips and place in the drippings. Remove the outside green leafs from the cabbage heads, rinse and lay them in a pile together on top of one another. 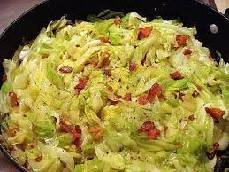 Slice the leafs in coleslaw type strips and place in the simmering bacon drippings and cook until they begin to wilt and soften . Cut the rest of the cabbage head in half and slice the same way as the outside leafs. Rinse and place in the pot after the large leafs have begun to cook. 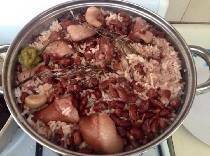 1 cup of red beans. 1 cup of white chopped onions, green & red peppers, and banana peppers. BR> Seasonings include, 1 pinch of paprika, red pepper, & garlic salt. In a skillet add 2 tablespoons of cooking oil and heat on med. Add onions, green/red peppers, kielbasa and shrimp and cook until lightly browned. In a large pot add beans, crushed tomatoes,green/red peppers, onions, kielbasa, and shrimp. Add seasonings and banana peppers and simmer on med heat for 20 minutes. Serve Hot! Wash meat put into a roasting pan with all the veggies inside salt and pepper to taste put into oven with top on roaster oven at 400 degrees. Season your chicken with McCormick® season all and add pepper (optional). Beat up some eggs and add salt and pepper. 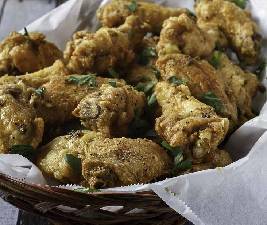 Dip chicken in egg and flour (self-rising flour) and let chicken brown on both sides. Mix cornstarch, broth and pepper until smooth and set aside. Spray a skillet with the garlic cooking spray and heat over medium heat. Season chops with salt and pepper and cook chops in 2 batches if necessary for 10 minutes or until well browned on each side. Remove chops and set aside. Remove the skillet from the heat and spray again with cooking spray. Add the onion and cook over medium heat just until tender crisp. Stir cornstarch mixture and add to skillet. Cook until boils and thickens, stirring constantly. Return chops to pan, cover and cook over low heat for 10-12 minutes or until the chops are done. Brown ground beef in saucepan and drain. Stir in Italian seasoning to ground beef. Place 1/2 noodles in bottom of greased slow cooker. Spread 1/2 meat mixture over noodles in slow cooker. Cover and cook on low 5 hours. In a medium-size bowl beat together the eggs and the milk. Then beat flour, powdered sugar, vanilla, and salt into the egg mixture. Strain the custard mixture using a wire mesh strainer into another bowl. Heat a skillet or a griddle to about 350 degrees. Brush the skillet/griddle with butter. Place the bread into the custard mixture, then flip over the bread, and then place the bread onto the hot cooking surface. Cook for 1 to 2 minutes on each side. The bread should be golden in color when cooked through. 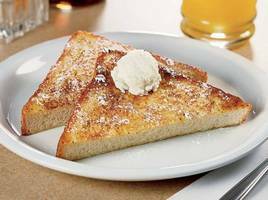 Cut the toast diagonally, and sprinkle with powdered sugar, and top with butter. Preheat oven to 350 degrees. Prepare seasoned flour by adding 1 cup of flour and the salt and pepper to a medium sized bowl. Stir until well blended. Cut wings for recipe. Cut wings on each join, there are two joints per wing. You can save the flapper (tip) portion for stock, or you may wish to discard this portion. Dredge the wing portions in seasoned flour. Shake off excess. Heat vegetable oil to 350 degrees. You can use any vegetable oil. Add enough oil to cover the bottom 4 inches of a medium sized saucepan. Cook wings for 5 to 7 minutes or until they start to turn golden brown. Place wings on a rack on a cookie sheet and bake for 10 to 15 minutes. When chicken is golden brown combine with melted butter and lemon pepper.